Manehattan Update #40: Smuggler’s Run 2.0 & Topaz Lake Score! Fillies and gentlecolts, welcome to week one of our one year anniversary celebration! I’m utterly delighted to announce that we’ve done some awesome new updates in Smuggler’s Run, our preview mod for Fallout: New Vegas! At the request of a few people, you now have direct access to the Smuggler’s Run Theme anywhere in the Wasteland through the Visionary Broadcast, a new radio station! Now, it’s just that theme for now, but we’ll be improving upon it in the coming weeks! Not only that, but we have a ton of new artwork for you to enjoy! The ripples caused by the strange reality changes have now changed even more of the Wasteland, so you’ll now have Blue Nova’s amazing Steel Ranger poster, but you’ll also get a revised version of Pinkie Bombs, Giddy Up Applejack, I have a Science Degree in Science and for the first time, Captain Cosmos has been replaced by none other than Daring Do and the Quest for the Sapphire Statue! At present, we only have these as standard posters and haven’t gotten to the Lightbox versions yet, but those are on the way. You’ll also get the Rocks are Cool poster and Vinyl’s Rave poster! But wait, there’s more! You’ll also get the Rarity Sierra Maredre poster and the Iron Will Sunset Sarsaparilla posters by Pixelkitties! Not only that, but everything has been now compacted into a single .BSA archive file so no more worrying about files going all over the place. This is more a background change, but it’ll make updates a hell of a lot easier in the future for everyone. And we’ve saved the best for last. Blue Nova has fought through intense migraines and crazy work schedules to create something truly epic for you. 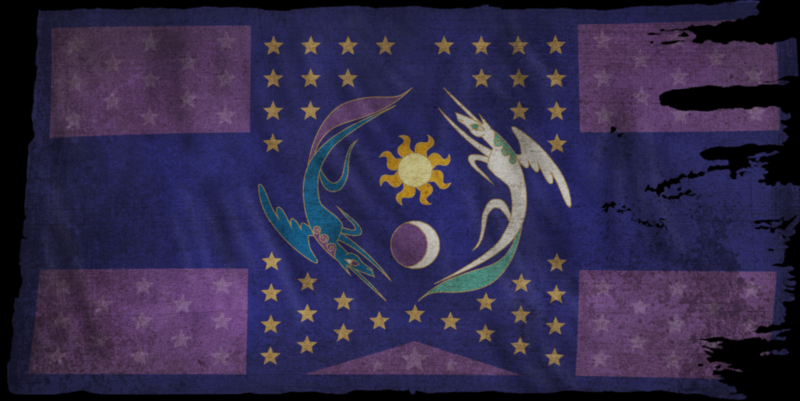 The flag of Equestria herself, which will now replace ALL US Flags in game! So what are you waiting for? Head over to the Nexus and get it right now! We’ve also got another new Music Score for you! This week is Topaz Lake, the headquarters of the Visionary forces in Appleloosa Valley. While Redeye sends the orders, it is the mysterious Gemstone who carries them out. So take a look at the latest screenshots of Topaz Lake with our brand-new music trailer! That’s it for this week folks. Just wait until next week…because we’re going to blow your socks off with what we have in store for you! Have a great day and enjoy the updates! These scores never cease to impress me, it makes the wait for the full release of this that much worth it. B) Awesome work, Corvus.